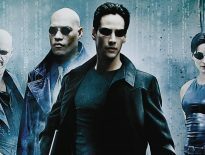 A few months ago, while we were preparing The Matrix Week for publication, we put word out to our friends online for their thoughts on The Matrix – either the entire trilogy or just the original film. They graciously accepted my invitation to write a few words, and so without further ado, here’s the first for the week! Dan is the creator and owner of Top 10 Films, a UK based website dedicated to film related top 10 lists and films reviews. Once you’ve read this post, we suggest you head over to visit his site for more of his stuff!! The music kicks in, the bullets fly, The Matrix hits top gear! I didn’t like the film when I first saw it. I was probably too young to really appreciate it for it was – a genre redefining action movie that had more intelligence in two hours than Hollywood had managed in the preceding ten years. For me, The Matrix’s visceral grandeur is made all the more exciting by the music video styling that gives violent shoot-outs and kinetic fight sequences the poise and beauty of ballet set to fast-forward. Now, viewing The Matrix is a reminder that action movies can be visually exciting on the surface and have depth, story and character underneath. What the film does so well is marry the two – this is intriguing science-fiction and awe-inspiring action-adventure. 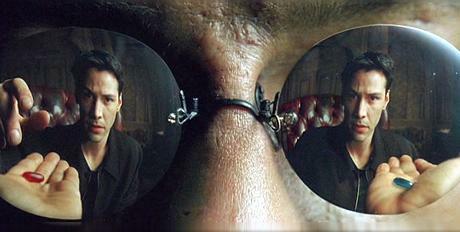 Dan takes the Blue pill…. 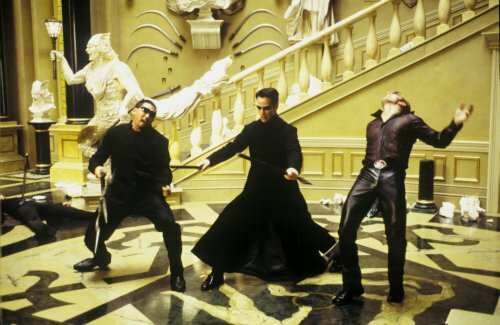 If you asked me what I love about The Matrix I would have to reply: it’s the fight and battle sequences that have the tightly constructed choreography of finely tuned dancers with the rhythm and energy of a rock n roll music video. It’s exciting, visually enthralling, fast-paced and fresh. Running up walls and jumping through the air firing automatic weapons has never been this cool. And, doing the Karate Kid kick while floating in mid-air has to be one of the best things I’ve ever seen! It is done in such an authentic setting, this world the Wachowski’s have created is a believable post-apocalyptic future much like the computer-ruled wasteland seen in James Cameron’s Terminator films. It raises profound questions about the way we use technology, our growing dependence on its continual advancement, and a future that doesn’t appear so far-fetched. And then, of course, there’s bullet time! Perhaps most interestingly, The Matrix introduced audiences to a new interpretation of an old camera technique to present action sequences in ways we had never seen before. The technique used a number of still image cameras to photograph an event almost simultaneously, allowing the director to move around objects or people at normal speed while the subject remained in a slow-motion state. The effect was furthered by showing bullets moving through the air at significantly reduced speed so that viewers could actually track the movement of each individual bullet. This style would be further advanced during the making of the sequels but it was the original film that introduced audiences to this awe-inspiring visual feast. 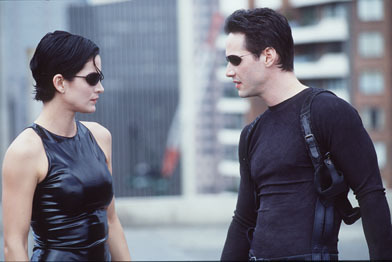 Ultimately, The Matrix, appearing as it did at the end of the 1990s, marked the dawning of a new wave of special-effects in Hollywood throughout the first decade of the 21st century. Films would mimic the bullet time style while computer-generated imagery would continue to advance as witnessed in the digital animation films of Pixar and Dreamworks, the use of motion capture in Lord of the Rings, The Polar Express and Avatar, and a new found popularity in 3D. © 2011 – 2014, Dan Stephens. All rights reserved.